Found 8 file extension associations related to Acorn and 1 file format developed specifically for use with Acorn. Developer / company: Flying Meat Inc. Built on a foundation of simplicity, Acorn eschews the outmoded “many palettes” design from yesterday’s editors. Acorn presents a fluid new interface that will be familiar to users of Apple’s iLife applications. Designed for simple editing, Acorn features flood fill, gradients, vector shapes, drawing and erasing tools, and more. 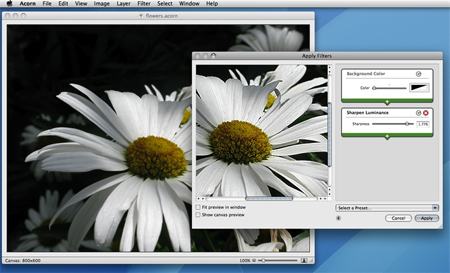 It also brings a few new tricks to the table, including chaining filters and easy image and canvas resizing. With plenty of power but zero bloat, Acorn will suit many needs. From quickly adding text to an image to creating a new graphic with pixel-precise control to just sketching out ideas, Acorn is great for all kinds of image editing. If you need more information please contact the developers of Acorn (Flying Meat Inc.), or check out their product website.